I've got another great video to share with you today. This time was a special treat, because I got to visit the Graphic 45 offices as well as tour the Portland and Seattle areas, and of course teach at the fabulous Running With Scissors scrapbook store in Kent, WA. I hope you get a moment to watch this fun video tour. It sums up this great trip perfectly! 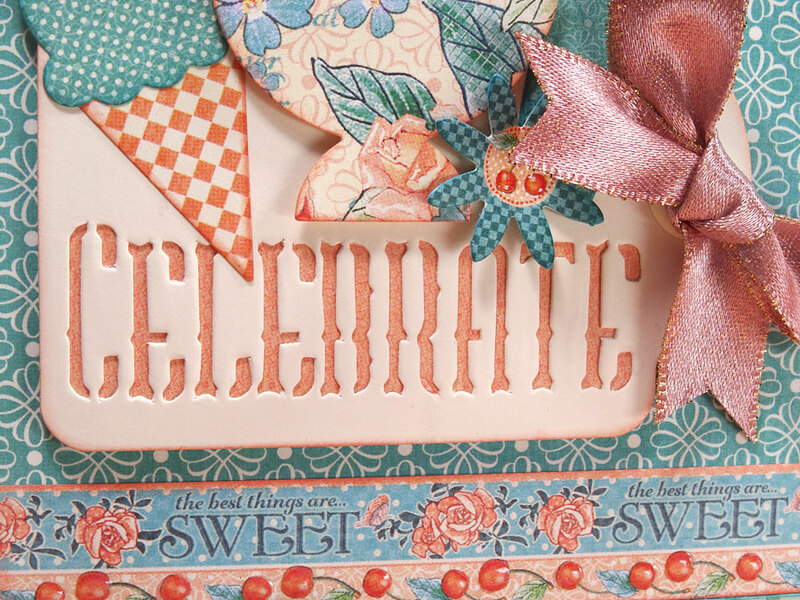 Today I'd love to share with you this 5" x 7" birthday card I designed using Graphic 45's Café Parisian collection of papers and flowers, along with Celebrate tags. 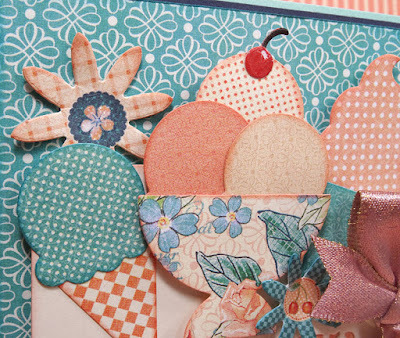 I love the new Frozen Treats die from Stampin' Up, don't you? I'll provide links to everything as I describe them in my tutorial below. 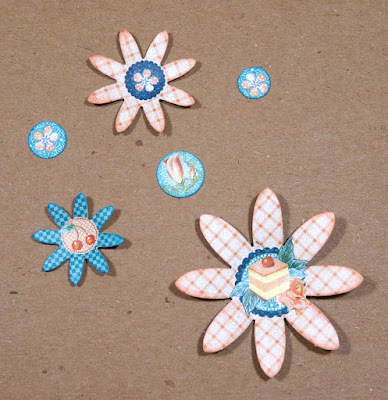 Before designing my actual card, I like to begin by selecting embellishments. Here I've popped out a few flowers and circles from the Café Parisian Flowers pack. These are great because they're card stock thick, pre-cut, and are printed on both sides. Talk about quick! Next, I die cut various Café Parisian papers using Stampin' Up's Frozen Treats dies. 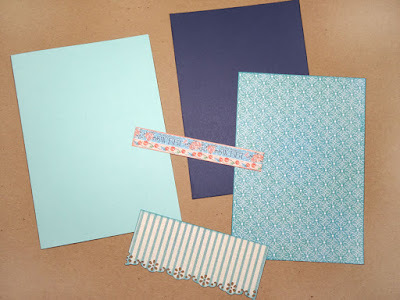 I used both the 12 x 12 Paper collection and some from the Patterns & Solids. 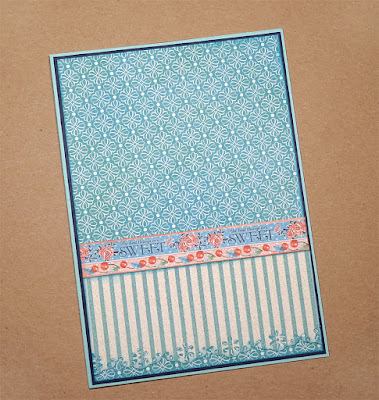 I cut a 5" x 7" card base from light blue cardstock, a 4 7/8" x 6 7/8" piece of dark blue cardstock, then a 4 3/4" x 6 3/4" pattern paper piece. 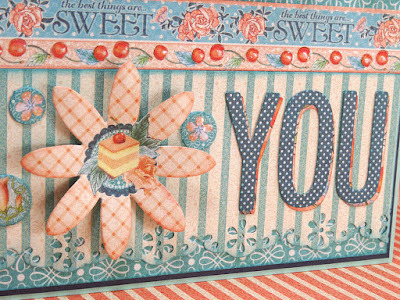 The striped piece is 4 3/4" x 2 1/4" wide before punching the border, then a 4 3/4" border strip with the words and cherries. I lightly inked the edges of all the pieces with coordinating ink colors. On a soft mat with the flowers face down, gently stroke the petals outward-in with a large ball stylus to create dimension. 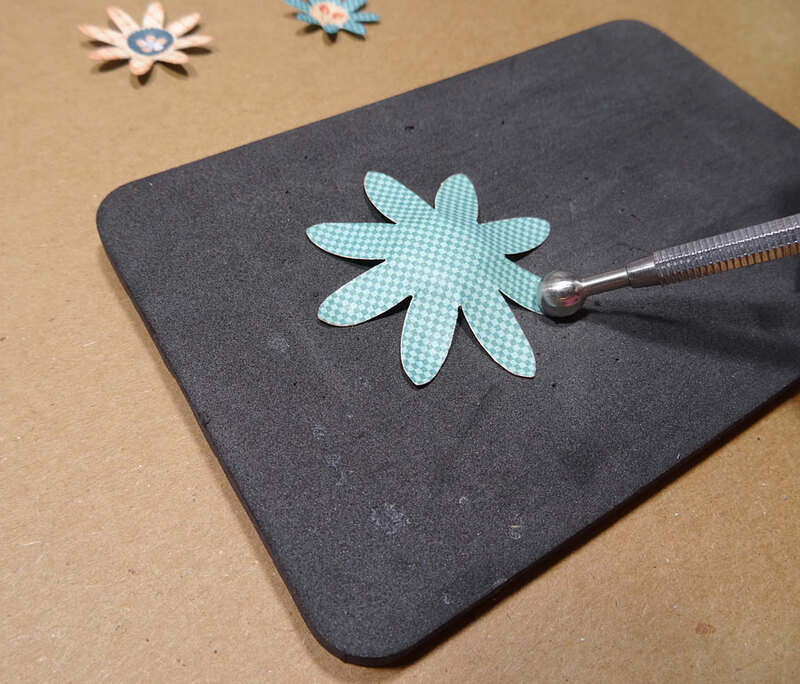 Then flip the flowers face up and "stir" the centers while pressing into the soft mat. Layering elements as desired. 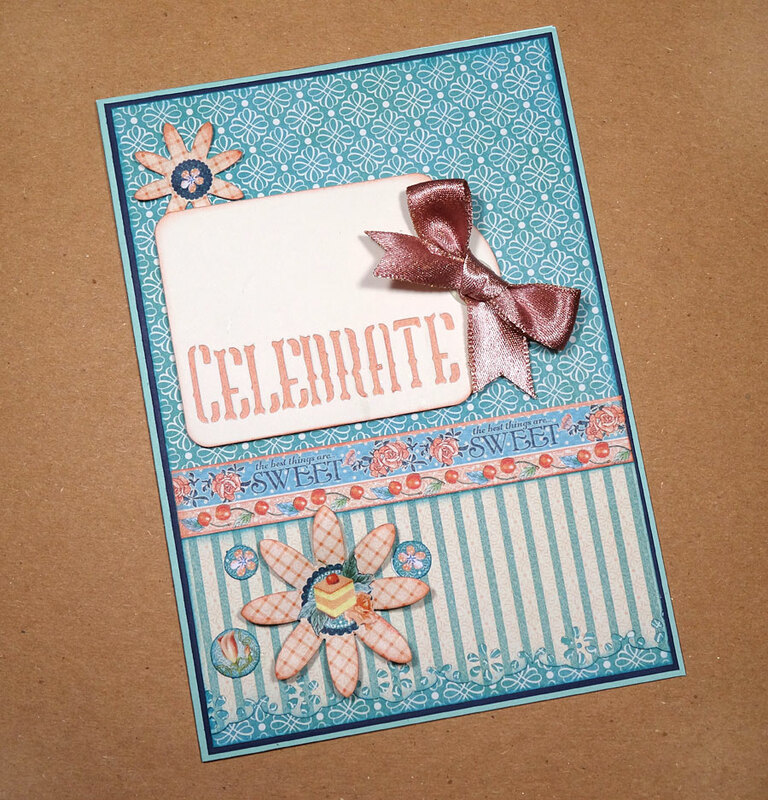 I popped up the Celebrate tag with foam tape. 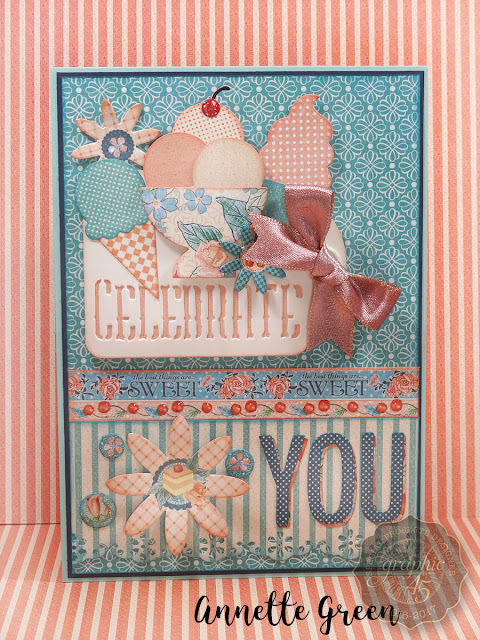 Keep on layering and having fun! And don't forget the inside. Here I've used more Café Parisian papers (love those cherries!) 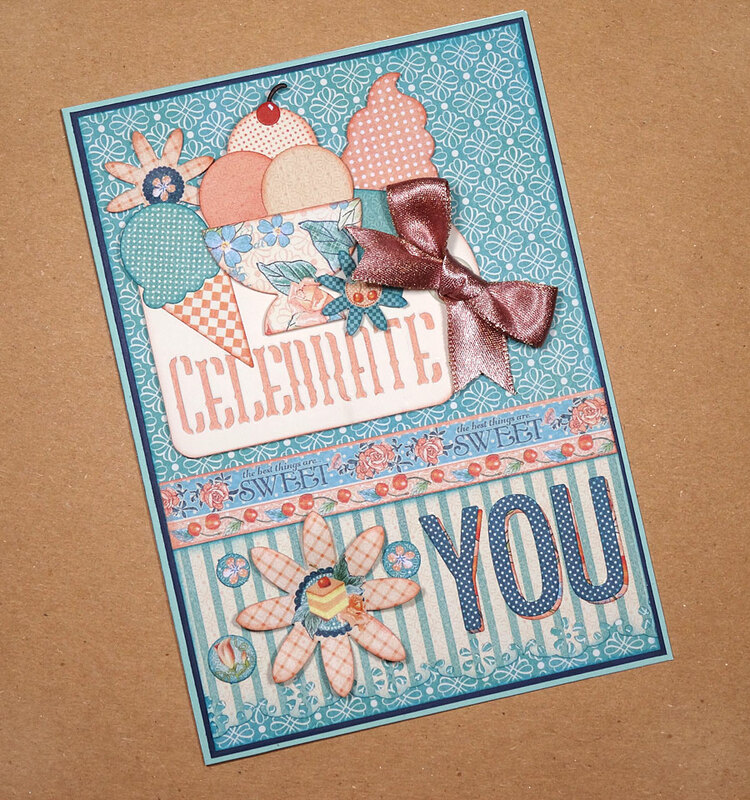 and used Stampin' Up's soon-to-be-released "Labels to Love" stamp and Everyday Label Punch. 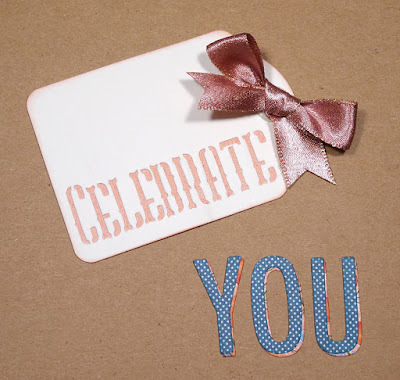 Contact your Stampin' Up demonstrator September 1st to get yours. 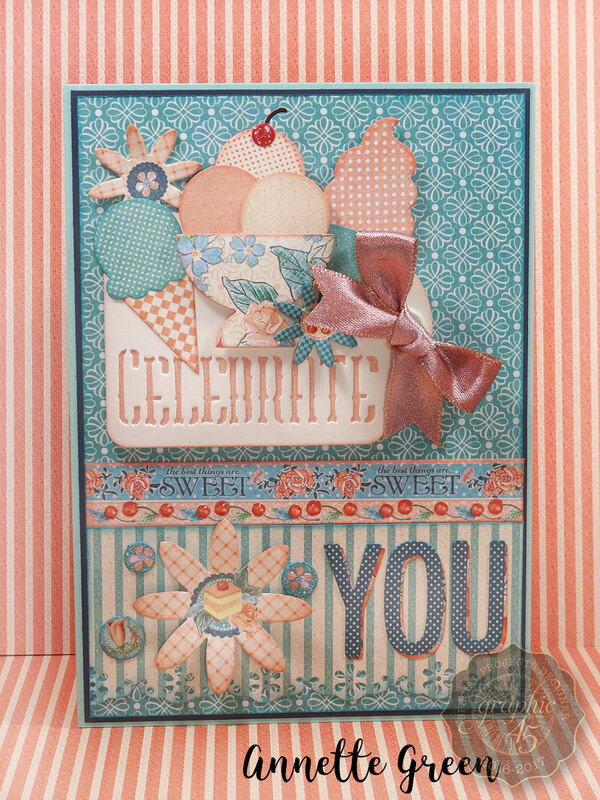 What a fun card to create! Simple, right? 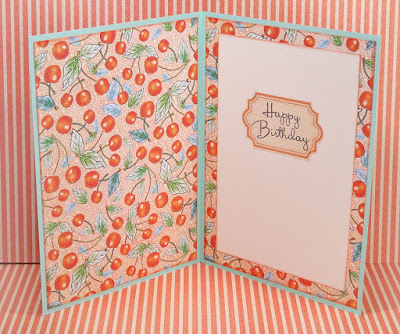 So my question to YOU is do you make your own cards? If so, do you get together with friends or make them on your own? I hope you've enjoyed my tute today. Not able to find Graphic 45 products in your local stores? 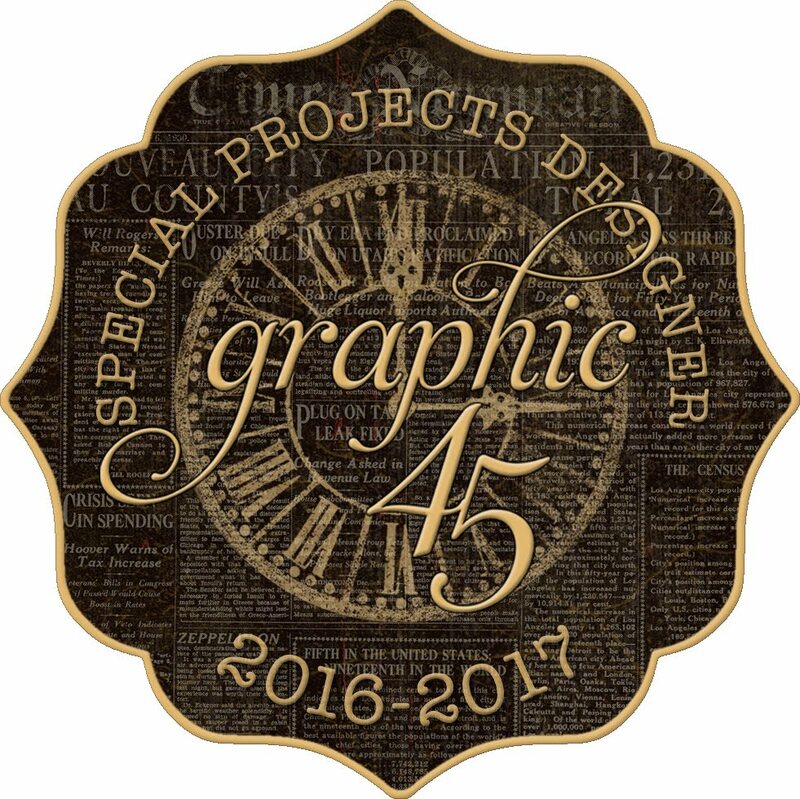 YOU can now order directly from Graphic 45 right here! Just wanted to let you know I've listed seven different kits in my Etsy shop today. 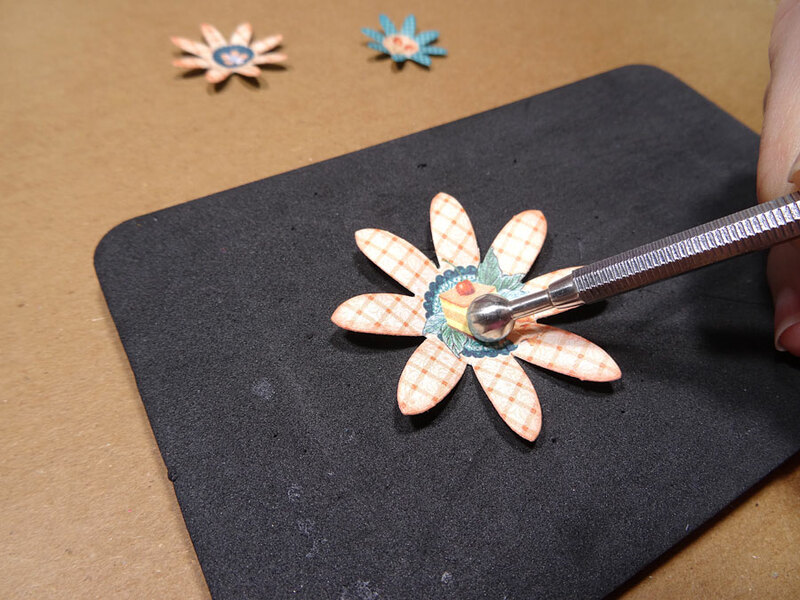 For a quick view, check my KITS tab at the top of this blog. To go straight to my Etsy shop to read all the details and costs, go here. I'll be back in a few days with a fun card I'm working on this afternoon! Hello everyone! 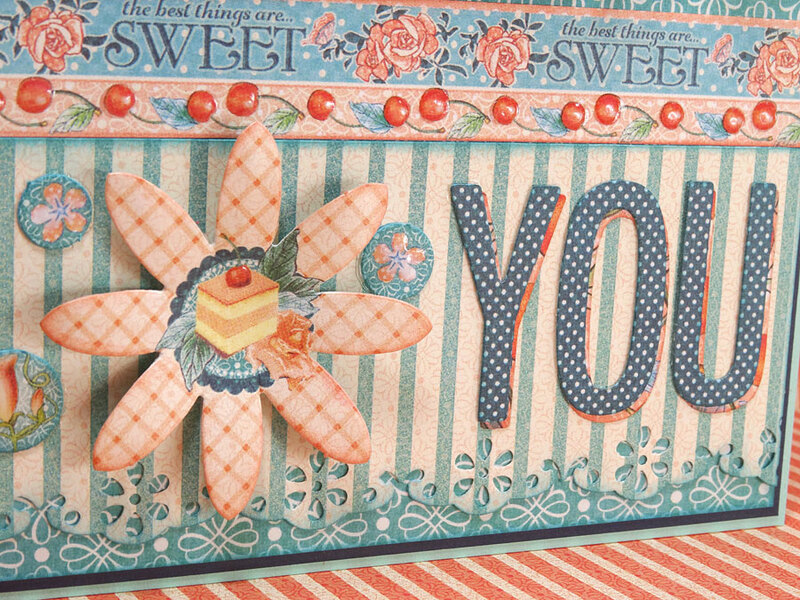 I'm back from my Seattle trip and had a fabulous time teaching at Running with Scissors in Kent, Washington. I also spent time with fellow crafty friends, Ginger Ropp and Maggi Harding, visiting the Graphic 45 office in Portland, Oregon. Something I've been dreaming of for a while now. If you follow Graphic 45 on Facebook, you may have seen the Facebook Live we did last Friday. It was GREAT fun! You can still view it here if you like. 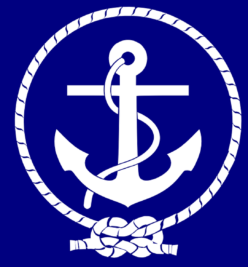 Just scroll to Friday, August 11th. 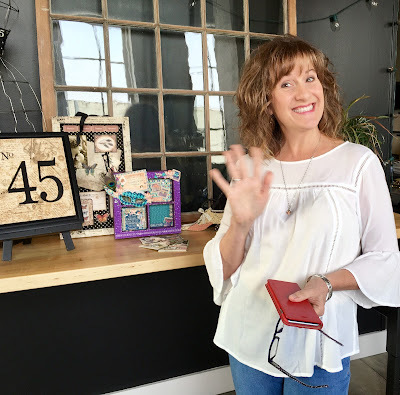 I'll be sharing a video not only of the Running With Scissors shop, but also some great peeks at the Graphic 45 office and lots of fun photos and videos of my trip around Portland and Seattle. So hang in there for that soon. Today I just wanted to let you know that I have posted my Enchanted Forest Box and Album Tutorial today. It's listed under the Tutorial tab at the top of this blog. There you'll see details and a link to my Etsy shop. 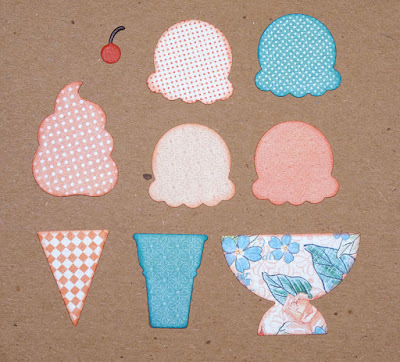 In the coming days, I'll be posting KITS! Yes, I've got just a handful of kits left over from my Graphic 45 teaching tour this year. If you follow my blog, you've seen all the fun classes I've offered. There is a very limited number of these, so if you like what you see, grab 'em up quick before they're gone! 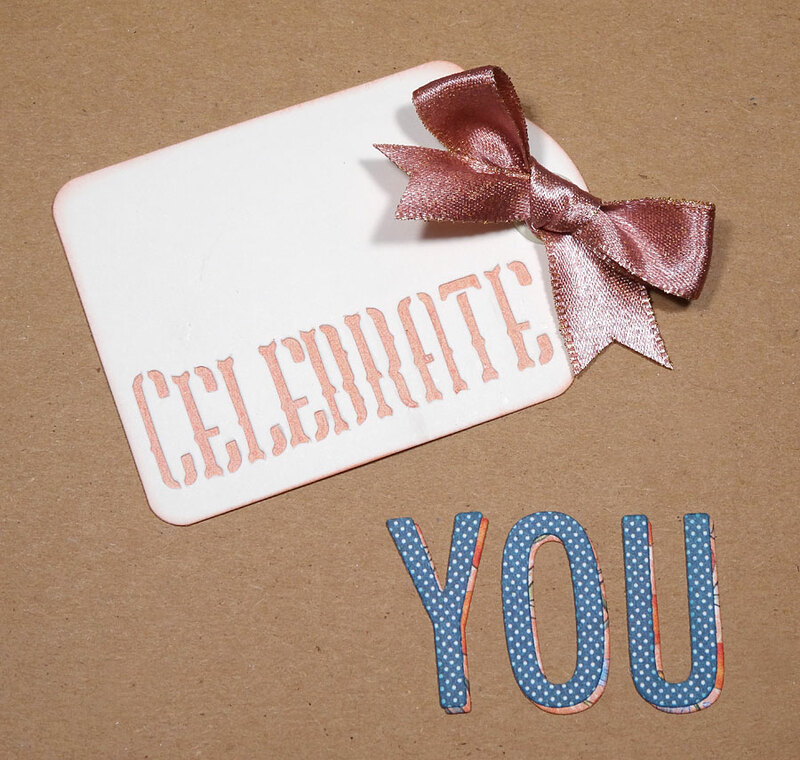 The best way to know when I post kits is to "favorite" my shop on Etsy, or you can subscribe to my blog in the upper right corner, OR you can check my blog every day. Note: The subscribe option is great because it goes to your e-mail inbox, however it is delayed almost 24 hours from the time I post, which means by the time it gets to your inbox, it could already be sold out. So I recommend "favoriting" my Etsy Shop, and you'll get a notice as soon as I list something new. 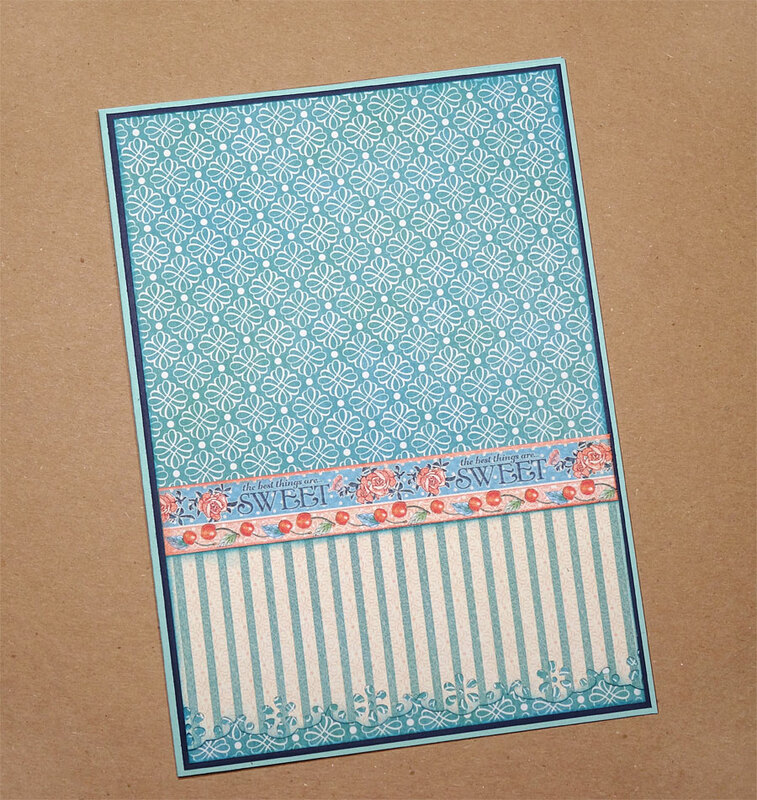 Just go here to make my shop a favorite.